But first, we visited the kiddies at the Ho residence, and even managed to pet the bunny again... all the time snacking on some charcuterie Mr. Ho brought back from France and sip on some bubbly. 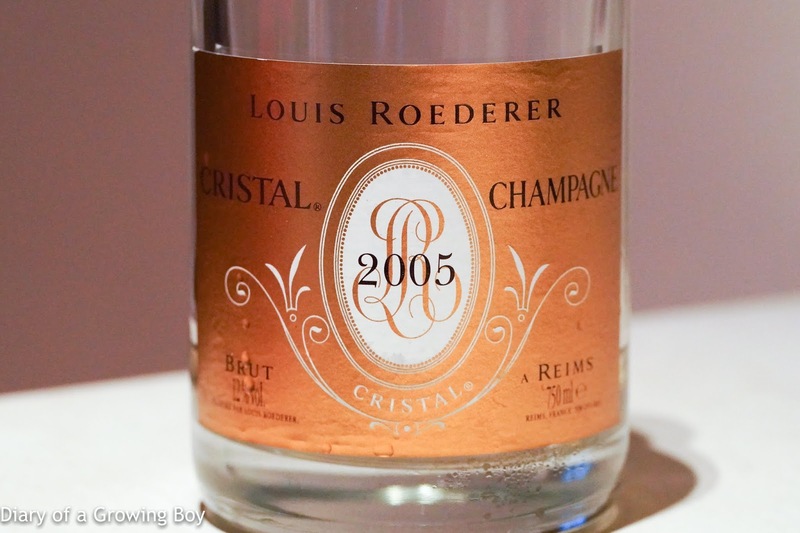 2005 Louis Roederer Cristal - floral nose. Easy to drink, but otherwise unremarkable. Once at the restaurant, we chose to pick items à la carte instead of going with their set menus, and also took advantage of a couple of their specials shown on the board. 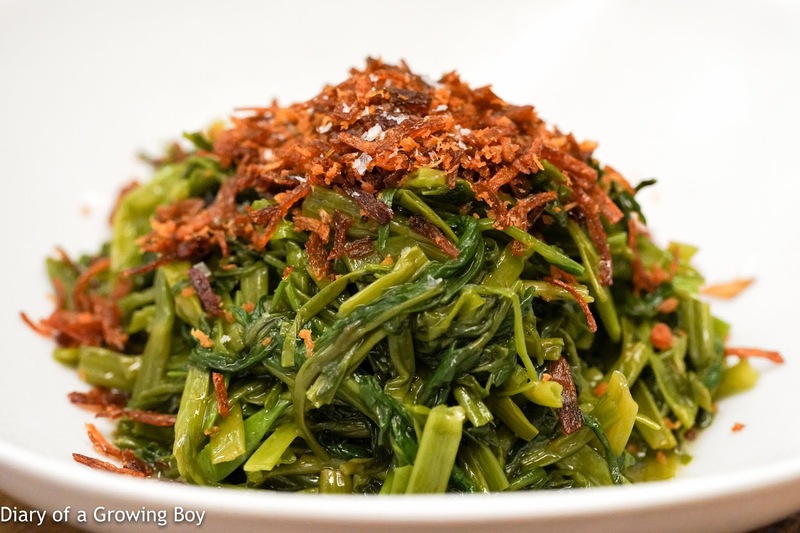 Water spinach (Ipomea aquatica) "kang kong", chilled, blanched, tossed in calamansi juice, dried shrimp and fried shallot grapeseed oil - I was a little surprised (and a tad annoyed) initially when this was the first dish to show up at our table. Normally kang kong should be one of the last dishes to arrive, but then I realized this was meant to be taken like a salad. It was a refreshing way for me to eat water spinach, and the acidity was pretty remarkable. The fried shallot oil, of course, filled the mouth with a wonderful fragrance. 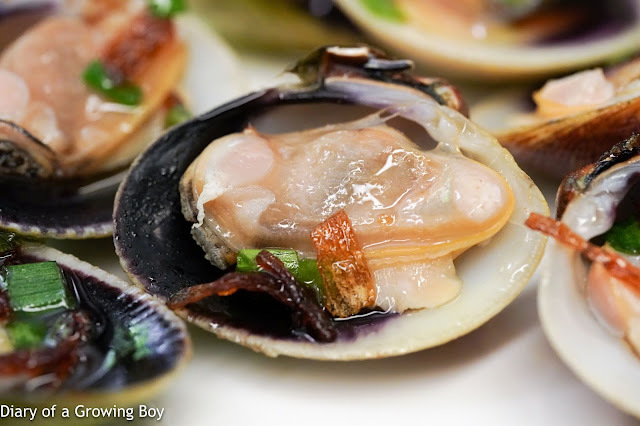 Wild-caught New Zealand littleneck clams (Austrovenus stutchburyi)), flambéed in white wine, drizzled with fish sauce and fried shallot grapeseed oil - this was a total surprise, and these guys kinda hit this one out of the park. These were so, so, soooo tasty! The fried shallot grapeseed oil that's been drizzled on them clams iz DA BOMB! And no salt was added in the cooking process because the clams themselves had enough flavors. Hello Kitty said that these reminded her of the amazing scallops we had at Princess d'Ân Nam Resort and Spa in Vietnam, and I definitely agree. For someone who had never cared for clams, we were amazed to see Mr. Ho dig into these, and then order up a second plate because he just couldn't get enough. 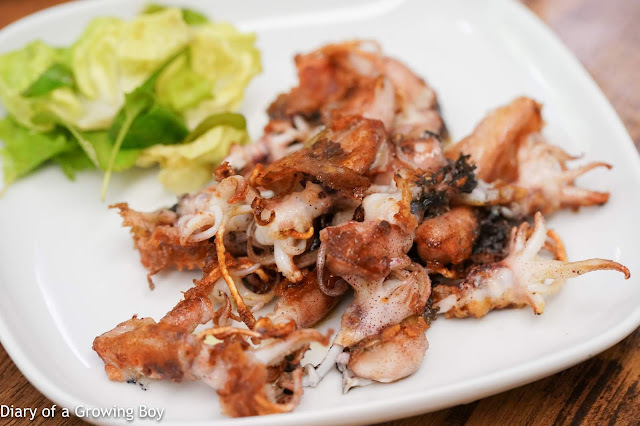 Wild-caught gloomy octopus (Octopus tetricus), sous-vide in kombu and grilled on cast-iron griddle - these were pretty decent. Queen crab rice vermicelli "beehoon" - a seemingly simple dish, but this one was all about the purity of flavors. Nothing but some snow crab (ズワイ蟹) legs from Hokkaido, deep-fried beehoon (米粉), then just pour the clear crab broth on top and watch the rice vermicelli soften as it soaks up the broth. Such clean flavors! 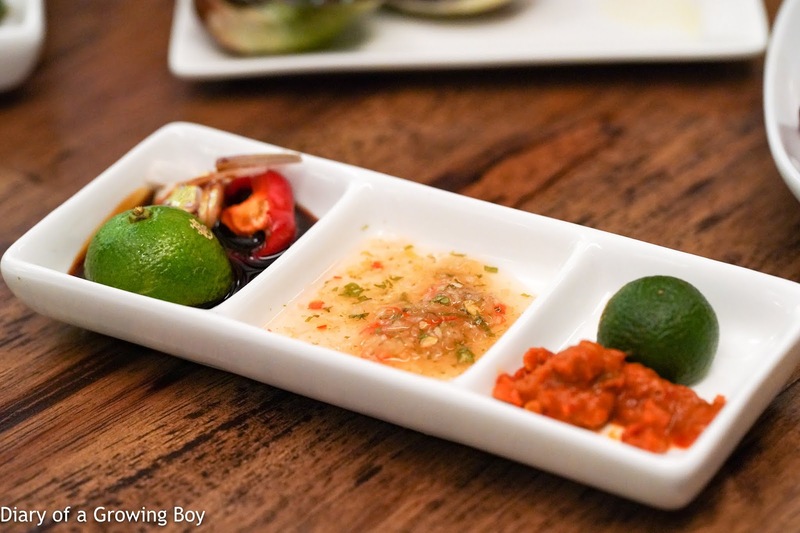 We were presented with condiments for our dishes. 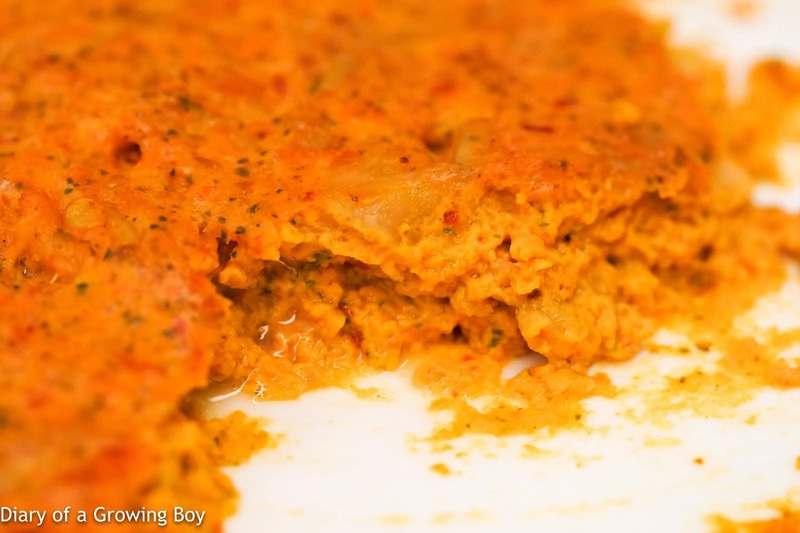 Scallop roe and skirt otah - now THIS was very interesting... Instead of just being a fish paste/mousse, the kitchen has decided to dice up the roe and skirt of scallops and mix them in. So in addition to the traditional flavors of otak-otak, you've also got little chewy bits here and there. Very nice. Broadbanded thornyhead "kinki" - I can't resist ordering up kinki (喜知次) when I see it on a menu, and this came in at about 250g. 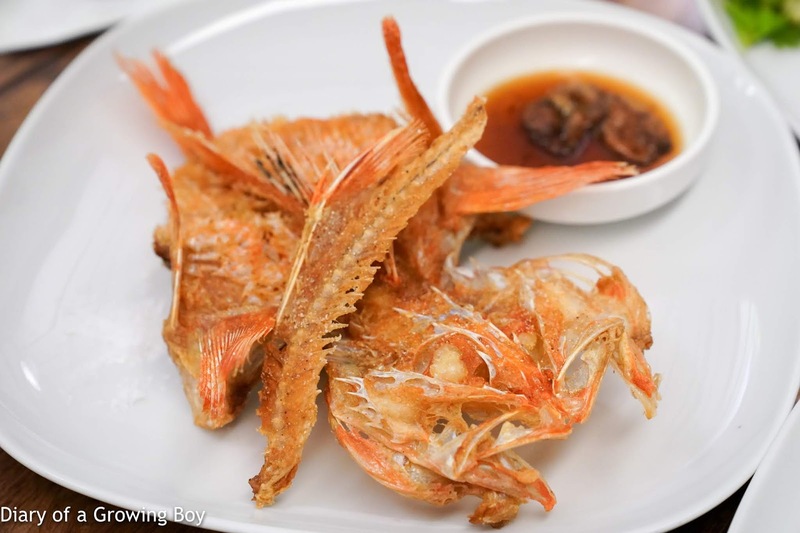 Deep-fried until crunchy, with upturned scales - similar to how fine dining establishments work with tilefish (甘鯛) - that are just sooo delicious. 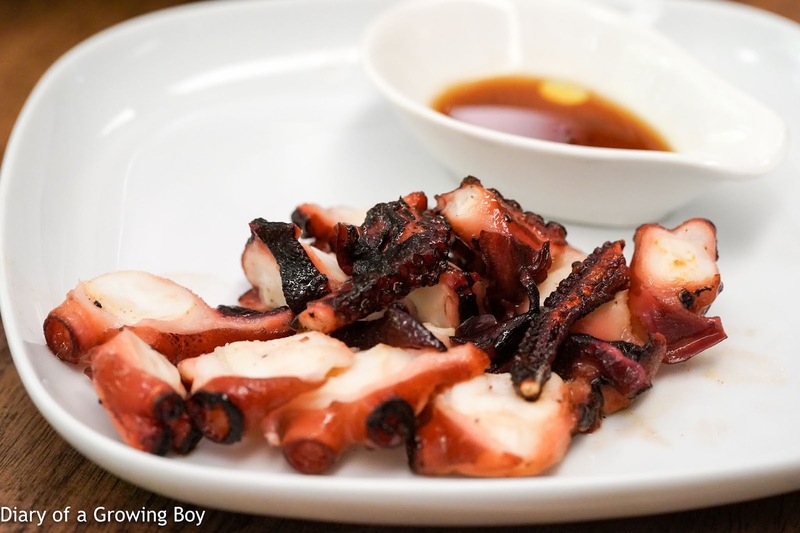 Served with its own liver marinated in ponzu (ポン酢). 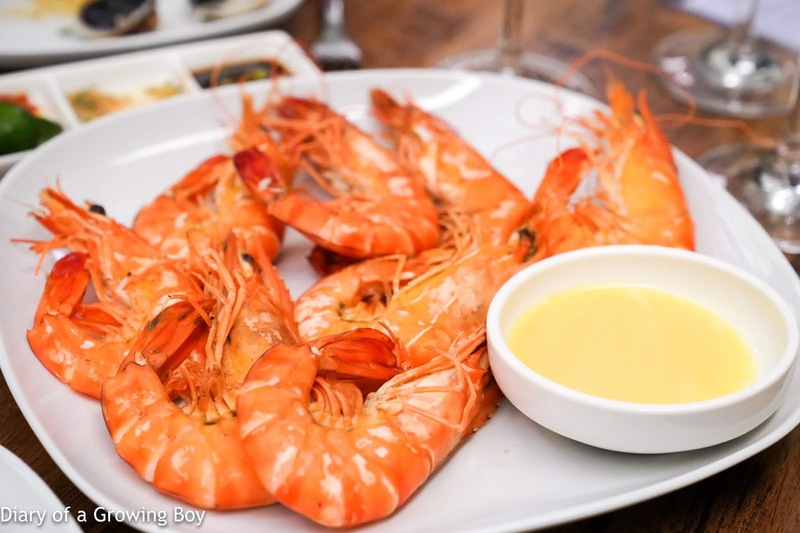 Farmed giant tiger prawn (Penaeus monodon), grilled on sea salt, served with salted egg yolk dip - these were pretty big and decent, but I'm not sure if they're significantly better than what's available at numerous seafood restaurants around town. 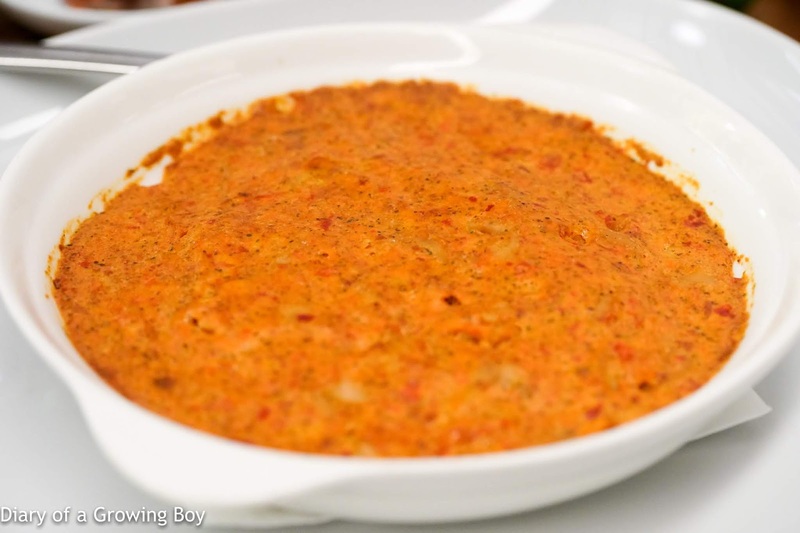 The salted egg yolk dip, though, was interesting - and probably a healthier way to do this rather than smothering an entire prawn with salted egg yolk. House-made Naked chendol - I can't resist having chendol when I'm in town, so I ordered one up - my second of the day. 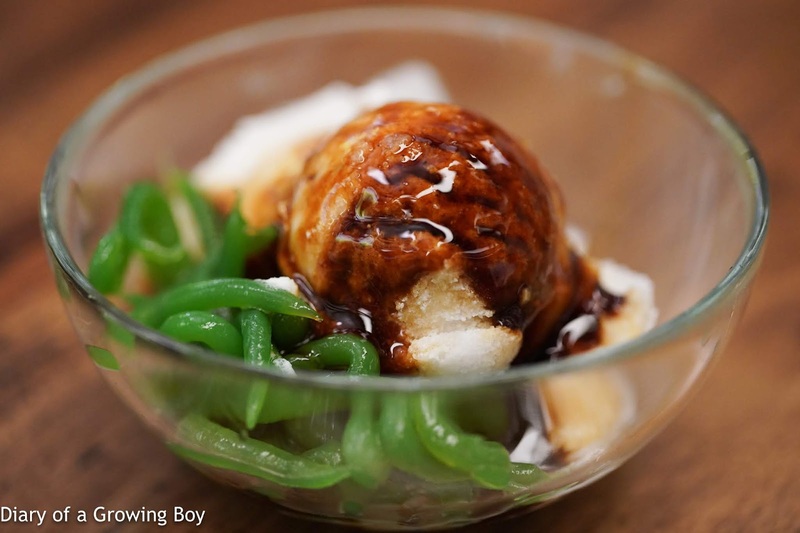 The coconut ice was delish, the gula melaka syrup was thick and rich, but the pandan jelly was a little too chewy and tough... probably had been chilled a little too much. I felt bad about only drinking Mr. Ho's wines whenever we have dinner together, so I decided to carry a couple of bottles from my cellar. I was ever so grateful that both drank well tonight. 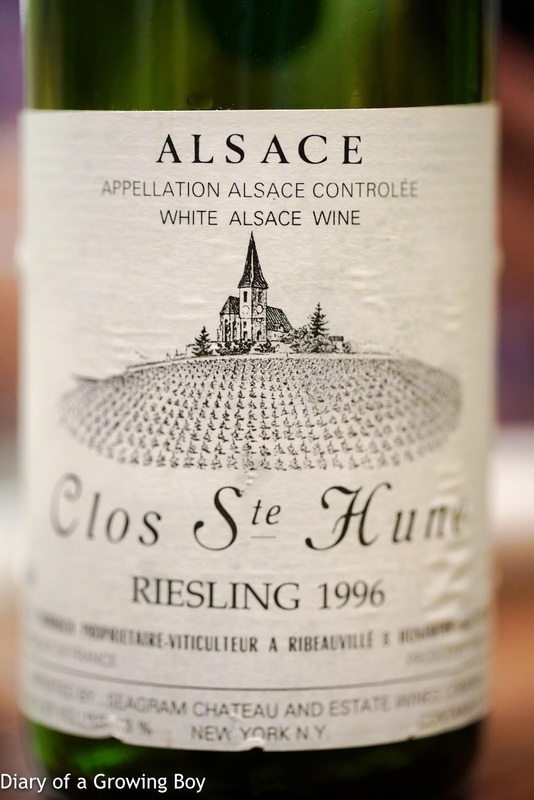 1996 Trimbach Riesling Clos Ste. Hune - such a classic dry riesling, with petrol, flint, and lemon notes. Very good depth of flavor here. Beautiful! 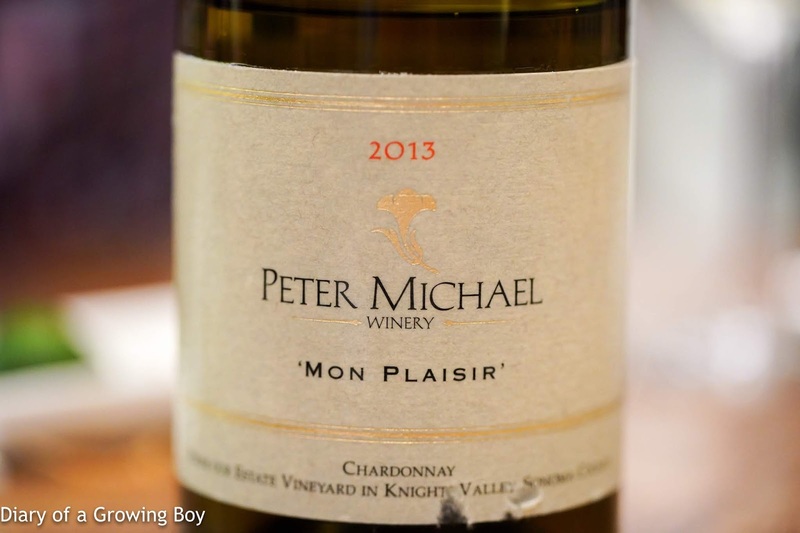 2013 Peter Michael Chardonnay 'Mon Plaisir' - very sweet nose, with plenty of tropical stone fruits and vanilla. So buttery and fragrant.